There are servants' quarters in each compound, and no natives other than the servants of residents are allowed to take up their abode within the Reservation Area. Building operations are being continued as quickly as labour and materials can be obtained, and the staffs of other European firms will move into houses on the Ridge as soon as the necessary accommodation can be provided by those at home who are responsible for their welfare. To such an extent have the conditions of life in Accra already been improved that the white woman, who not long ago was quite a novelty anywhere in the Gold Coast, is now frequently to be seen in the capital. The main road from the beach follows the coastline to Christiansborg Castle, originally a Danish fort and now the residence of His Excellency the Governor and Commander-in-Chief of the Gold Coast Colony and its dependencies. Situated on this main road, in the neighbourhood of the Ridge, are various Government offices. Some of these offices have been rebuilt in a style and size that is worthy of an important capital; others are reminiscent of camping days in newly-acquired territory, but their out-of-date state in comparison with the Colony's achievements and possibilities is largely due to the war, which came as a hampering influence to progressive activities at a critical time when the country, which had for centuries been ravaged by slave raids and tribal warfare, had just begun to benefit from the stable government following on British occupation. Working under great disadvantages, the Government of the Gold Coast has rendered much practical assistance in promoting the industrial development of the country, notably by the provision of a widespread network of roads. Take care not to be tempted into saying unkind things about these roads, particularly when you return bruised and sore from a motor-bumping excursion along them by car or lorry. Remember they were carved out of jungle-lands at a time when funds were scanty and there was no great industrial achievement to prove beyond dispute the advisability of thus opening up the country. Remember, too, that it was impossible to keep the roads in anything like proper repair during the war. Whatever be their faults, these roads are a fine testimony to a far-sighted policy, which has been a prime factor in bringing the country to its present stage of prosperity. The Government-made roads opened up possibilities for motor transport, and the well-organized development of motor transport facilities which followed, thanks to the enterprise of the British merchant community, is largely responsible for the success of the Gold Coast cocoa industry. 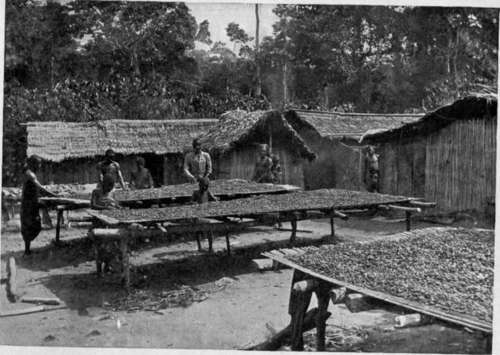 Further, as regards Government activities in so far as they have directly affected the cocoa industry, special mention must be made of the work done by the Agricultural Department, through the medium of travelling instructors and of object-lesson experiments at Agricultural Stations, notably at Aburi, near Accra, and at Coomassie. Our host has just rung up from his office to say that, in accordance with the wish we expressed over lunch, the car is now on its way to the bungalow to take us for a last look at the commercial sights of the town before we go up-country. Ten minutes later we are in the thick of cocoa traffic, constantly passing or meeting motor lorries with trailers, some piled up with sacks of cocoa that are being transported from the railway station to stores, others returning empty to the station to load up again for the stores, or going back to a store to get another load for stacking on the beach ready for shipment. Now and again we greet and are greeted by a white man, riding on a lorry, or, like us, going about his business in a car. But the pedestrian crowd that throngs the streets, the policemen, the motor drivers, the boys perched aloft on cocoa bags and singing themselves hoarse - the whole populace, in short - consists of natives. Outstanding among the buildings are the factories. Let us make sure that we clearly understand the meaning of "factory" in the Gold Coast sense of the word. A factory in this part of the world is a trading establishment, not a place fitted up with machinery and devoted to manufacturing according to the meaning we have been accustomed to associate with the name. The business of many of the factories is of a twofold nature - the purchase of produce and the sale of goods. For produce buying, the essentials of factory premises are a compound to serve as buying ground, office, warehouse, or as it is commonly called store, and residential quarters for the European staff; if the business includes the sale of goods, the premises must include a shop. There are some old-style factory premises left even in the main street of Accra, as you see; they are the barn and loft type of building. The barns are still used as shops. You are not interested in such poor-looking shops? If you passed an hour or two in any one of them any day of the week, early morning time for preference, and counted up the amount of money that is spent by the natives, 1 fancy you would jump at the chance of having an interest in the business. The lofts now serve as quarters for black clerks or as extra stores; the white men who used to be the top-story inhabitants now go off in their firms' staff-car to their home on the Ridge when the shop is closed in the middle of the day, and when their day's work is done. Some of the modern shops have windows, and one of them, of which Accra is justifiably very proud, is built and run on the lines of a European departmental store. Most of the shops cater for native custom only, and specialize in what are known as "trade goods"; cotton materials done up in long lengths and sold only by the piece, salt, hardware, kerosene, and beads are some of the principal lines in trade goods. However wide or limited be the range of a factory's operations, cocoa buying on a large scale is, as a rule, one of its principal activities; indeed, some of the factories do no business other than cocoa buying. The majority of the factories in the Gold Coast and Ashanti are owned by British firms, or groups of firms. Two 01 three French companies are, however, among the big proprietors. America, too, is now anxious to acquire an interest in established factories, and is also on the spot looking for opportunities to open up on her own account. Every important organization operating on the Coast has a chain of factories, consisting of central establishments in Accra and Coomassie, the two hubs of the cocoa industry, and branch premises in the principal cocoa-growing districts. Large stores for warehousing cocoa, until such time as it can be railed and shipped, are a feature of all the factories; even in the remotely outlying districts many of the stores can accommodate 5,000 bags, each containing 140 lbs. of cocoa beans, and this though they are within motor lorry access of clearing stations that have stores with a 15,000 or 20,000 bag capacity. Each chain of factories is controlled from home by its owners, the actual cocoa buyers. The headquarters of most of the directorates are in Liverpool, Manchester, or London. The West African staff of a chain of factories consists of European agents and assistants, together with a number of native clerks. On behalf of each directorate one European agent has charge of the Accra district, another of the Coomassie district; the assistants may be deputed by the agent whom they are under to help at his district factory, or they may be sent by him into the Bush to take charge of, or act as second-in-command of, a sub-station. Our host is the Accra district agent for the purchase of cocoa beans in the joint interests of two of the oldest and best known English firms of cocoa and chocolate manufacturers, Messrs. J. S. Fry and Sons, Ltd., Bristol, and Messrs. Cadbury Bros., Ltd., Bournville, Birmingham.